The Thanksgiving holiday is a wonderful time to be grateful for the angels we have in our lives and to share our love with random acts of kindness towards others. Whether you are gathering family for a traditional meal, traveling to visit loved ones or celebrating across the miles, spread the message of love, hope, peace, happiness and gratitude with angels. Here are some ideas for angel gifts, décor and special ways of saying thanks this holiday. Create a warm and inviting tablescape by incorporating angels into Thanksgiving décor. You can make your own angel stemware charms (guaranteed conversation starters) for guests to easily identify their drinks throughout the evening. Simply use beading hoops, angel charms and an assortment of beads to make them all different. Your guests will enjoy choosing their own angel stemware charm when they arrive. Angelic napkin ring holders can make holiday guests feel extra welcome and will bring smiles to the table as they notice the fun-loving detail. 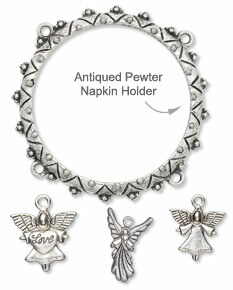 Embellish napkin ring components with beads and angel charms to take napkins from ordinary to extraordinary. Encourage family and friends to take their angel charms and napkin rings home as a reminder of the time together. Need a host/hostess gift? 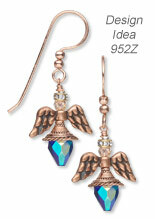 Make multiple stemware angel charms and napkin rings and gift as a set for a present that is sure to please. Let friends and family know how much they mean to you by gifting handmade angel jewelry, such as a pin, pendant necklace or earrings. 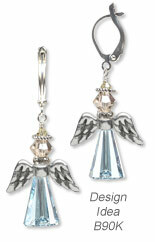 Angel jewelry also makes a great gift for family and loved ones you are unable to share the holidays with. Nothing says "I love you" and "thanks for being you" better than angel jewelry that can be worn and cherished throughout the year. Browse through hundreds of innovative angel design ideas and find FREE angel jewelry projects to create your own special gifts. Want to brighten someone’s day with a well-deserved thank you? Include an angel charm or jewelry with a note of thanks for an extra special presentation any time of year. This is a thoughtful way to thank the "everyday angels" in our lives. Your message of thanks will live on and on with the recipient as they wear their special angel jewelry and think of you.